Long before there was National Heroes Circle, or George VI Memorial Park, there was 'Race Course', where so many important events in the lives of Kingston's citizens took place. The area referred to as Littleworth is not named on any map I have seen so far, but would have been in the area marked in brighter green on this map, which comes from Long's History of Jamaica, 1774. 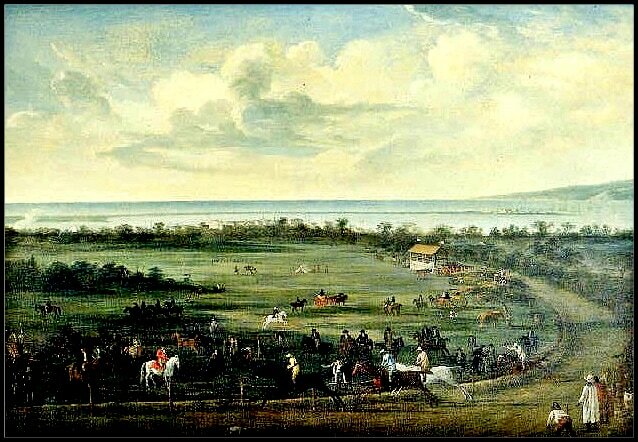 This painting, from c1796, by a French artist, F. J. Bourgoin, entitled Kingston Racetrack, seems most likely to be an image of the track at Littleworth.